Robbie drove up from Cork on a Sunday so we could enjoy a long-overdue lens summit. He has some new glass that complements my collection and we figured it was time to see just how good it all was. All done in a good natured way, because sometimes it's fun to just geek out. Plus there was fake tandoori chicken to be eaten. I say "fake" because I don't have a tandoor in my kitchen... a shame really, but no doubt the sort of practical constraint that can be excused. Still, no matter how much love you put into the preparation, you can't really call it tandoori chicken if you don't have the oven. You can gather and combine the ingredients, take the time to properly marinade, double cook to ensure tenderness on the inside and a bit of a crunchy exterior, and serve with all the right accompaniments. But no matter how good the result, maybe it should be called something else, just to be accurate. There's some sort of a metaphor to be made with camera lenses. We all know which ones are the "real thing" from countless reports and web forum postings, thousands of images available to be enjoyed, tests and pixel-peeping exercises, and the high prices they command. But what about the off-brand variants, the fancy new digital designs, the young pretenders? Should we be judging them by their flavour (how they render) or by their pedigree? If you're a flavour person you don't care what name is on your lens. You want the right image. You don't care if the brand is unknown or from the wrong side of the tracks. It doesn't matter how cheap the lens is. If you're a pedigree person you stick with the names you know. Leica. Zeiss. You don't care if the lens costs more or is less practical to use. In fact, this is a bonus, since it adds to the joy of a rare experience. Of course, things aren't really so black and white. We know that pedigrees got established because of their flavour. But time marches on. Are some brands coasting on past success? Should we bow to tradition? Or perhaps recognise that advances in technology can make real improvements in optics and image rendering? The only way to tell is to assemble some contestants and shoot some pictures. Which is what we did. The results might challenge our expectations but we're open to that. If you are open, you'll want to continue reading... next article coming soon. In the meantime, here are some highlights of our combined lens collection. It's based around K-mount and M42 glass. 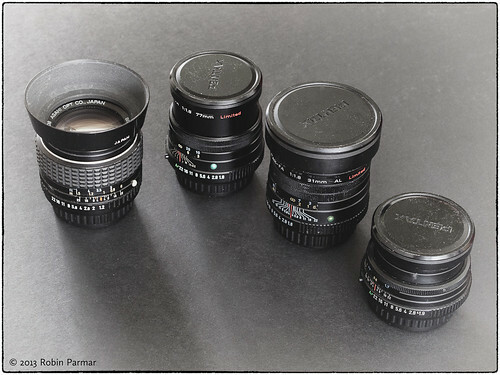 Since I currently shoot the Micro-Four Thirds system, I have the option of adapting lenses such as those listed above. But I can also utilise other mounts, like the delightfully tiny PEN F.
And then there are native MFT optics, of which I have a small but carefully chosen trio. Unfortunately we didn't think to take a photo of the assembled glass, but I posed some of the stars for the shot above. I hope this whets your appetite for some tandoori chicken and cucumber raita. Er, I mean for some lens test shots and comparisons. Coming up soon! Yeah me too! I don't make anything like "real" Indian food -- for one thing I make it too healthy!